Maybe I am being a paranoid doggy parent. Tonka has a really loose neck. So every time he drinks and eats his whole neck gets wet. I clean it whenever possible. But today I've started to notice it got a little pinkish. He doesn't scratch it or anything. But that part usually stays moist. I tend to wipe it and clean it after I see him drink water or eat. What do you guys think it is? Could apple cider vinegar help with this? If so, how would I treat it? I also took his collar off when he's in the house, hoping that would help. Thanks in advance. PS: I might be posting a lot in the forum , being a newbie to this breed. I just get afraid of every little thing I feel might be wrong when it might not be a big deal. I am still learning. Thanks for understanding and helping a fellow english bulldog lover. @jdotlim Oh that looks painful. Try to keep it dry it could lead to something worse. I try to wipe Fergus's chin and neck when ever I see him drink. Every night i wipe his chin and neck down with witch hazel pad. If I notice redness or bumps I will put some destin on the area helps to keep the area dry. You might also want to try Duoxo Pads (can buy thru Amazon) I dont use the duoxo pad every night only if I see a lot of pink or suspect yeast. I would also give him a bath and use a apple vinegar rinse it sounds weird but it really works. Leave the vinegar on do not rinse off let it soak in then towel dry him off after a few minutes. Also make sure you are using stainless steel bowls and wash them once a day. Hope he feels better soon Tonka is adorable. Last edited by Ashleym; 07-09-2013 at 01:34 AM. It's hard to tell in the picture but is it raw? It sure looks like it. No that's not normal. Wilson's chin used to get quit rusty from drinking water until I started using filtered water from the fridge and changed their water bowl to a stainless one. I've tagged a few people that might be able to help too. Oh and you post as much as you want too and make yourself at home, that's what we're all here for!!! We're not picky about repeated threads, so post away. I am no expert, but this looks like the same thing that happened to my boxer about 18 months ago. What type or collar did you have on him? In our case he was allergic to the type of dye that was used on the cloth covered collar he was wearing at the time which caused redness and irritation and eventual fur loss at the site. It could also be that with his collar on and all of his wrinkles not enough air is flowing across his neck keeping it moist which creates a hot bed for a yeast infection. I hope you find out what it is soon so your baby starts to feel better and I am sure that someone who knows a lot more than me will be along soon. Is that the only place she has these spots? 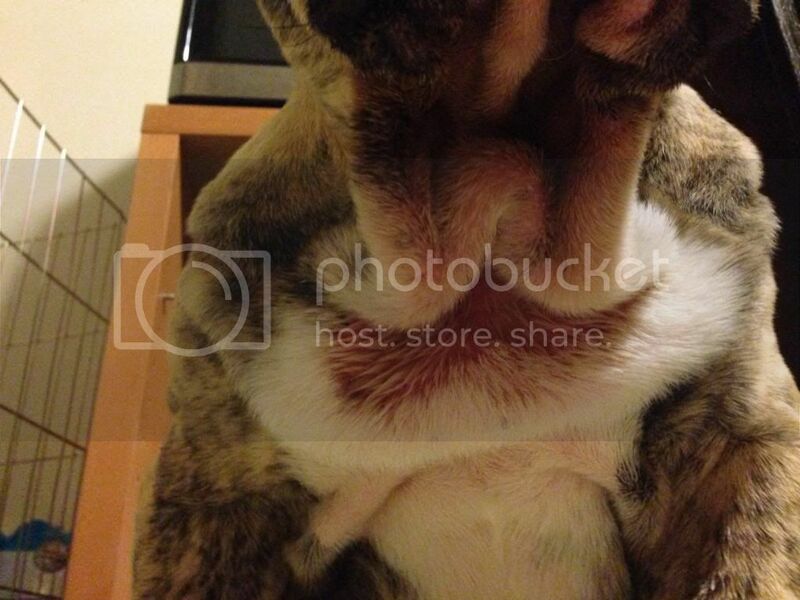 My basset hound had spots that looked just like that on her neck, in her arm pits and on her belly. It ended up being allergies. We had to have the allergy testing on her which is about 350.00, but we know what she is allergic to and she now gets a shot once a month for her allergies. She looks just like a normal doggy now. Check with your vet and see what they think about it. They may try pills at first and if that works that is good, if not, suggest the allergy testing. Hi. That doesn't look like anything caused by water. I hate to say it but that baby needs to see the vet asap. He needs his neck shaved and an antibiotic like simplicef. Until then you should wipe the area with some peroxide and follow up with a cortisone cream. thanks everyone for your response. And yes. Only in that neck area. I feel like its from all the drool, water, and food mixed together. Maybe it bothers his skin. I am thinking of taking him to the vet today. Is it something drastic that I should see a vet? Or do you guys believe taking a bath for him and using apple cider vinegar will be ok? I feel so bad for tonka and hate to see anything get worst. Last edited by cowsmom; 07-09-2013 at 10:36 AM. Brie gets her chin soaking wet too when she drinks and eats. I wipe it n dry it whenever she eats or drinks. Her chin gets a lil acne but her neck has never gotten like that. Please let us know what the vet said if you took him, n if he is better! Hey there! I sure hope you can get this cleared up because it is probably very uncomfortable. I would see the vet on this, it could continue to spread and I think it's beyond regular treatments. It could very well be a bacterial or fungal infection, or likely both! Malacetic ultra will probably help clear it along with a medicated shampoo, but it will be a lot of work on your part. 3 times a day cleaning along with medicated ointment like panalog. Make sure to change water dish 3 times a day and wash bowls, if you are using plastic bowls change to stainless or ceramic. Plastic harbors bacteria even if washed.